For most of my life, I have hated milk. It tasted absolutely horrible to me. I never liked it, and I have many memories of not finishing the cup of milk my mom wanted me to drink with breakfast each day. The beverage simply grossed me out, and I would refuse to drink it unless it was heavily sweetened with chocolate or some other sugar laden syrup. Unflavored cow’s milk and I were simply not good friends, and I avoided it like the plague. It wasn’t until about a year ago, after 25 years of hating cow’s milk, did I suddenly discover a love for it. Not just a love for it, but a passion for it! What suddenly changed? I tried raw pastured cow’s milk. For most of my life, the only milk I had ever tasted was from pasteurized (dead) milk that came from grain-fed, and drugged up (sick) cows. After I had enough with trying to approach my health the way the mainstream experts wanted me to, I decided to do a lot of research into organic, clean food and holistic health. The first thing I heavily researched was milk. I had heard from some friends who had found real food for themselves talk highly of raw milk, and something intrigued me. During my research, I found this video about raw milk from Sean @ Underground Wellness. This was the first time I ever encountered the idea that cows should be eating grass on green pastures, rather than being stuck in feed lots eating fattening grains like corn and soy. Not only are pastured cows more natural and healthy, but their raw milk is full of good bacteria and is highly nutrient dense (especially in comparison to pasteurized milk). Many people with lactose intolerance can drink raw milk with no symptoms, because raw milk still contains lactase, the enzyme our body needs to help us digest lactose. When milk is pasteurized, that lactase is killed off with all the other good bacteria. From Raw-Milk-Facts.com, I learned all about why people began to pasteurize milk. Until a hundred years ago, cows were raised on green pastures, soaking in the sunshine and feasting on delicious green grass. These cows produced delicious raw milk that didn’t need to be pasteurized (heated up to kill bacteria) because the cows were healthy and thrived off the foods nature intended them to eat. However, in the early 19th century, Americans living in cities began to get sick from drinking milk from their cows. The reason they became sick was because their cows were living in the city, not eating the right foods (eating grains instead of grass) because there were no green pastures for them to live on in the cities. These cows also got poor quality grains because the high quality grains were saved to brew alcohol. Additionally, the cows lived in poor conditions (most likely without sunshine) and became sick themselves. These sick cows produced bad milk that made humans who drank this milk sick. An epidemic followed. To fix this problem, people began to cook (pasteurize) milk until all the bad bacteria in it were dead. However, this killed all the bacteria in the milk, good and bad. The bad milk coming from sickly cows no longer got humans sick, but it also no longer carried the awesome good bacteria anymore (if it had any to begin with). This left the milk as a dead food. Pasteurized milk goes putrid as it sits around. But when raw milk (still alive) sits around, it turns sour and can be used to make sour cream, cheese, curds, whey, yogurt, butter, and all sorts of other dairy products. Unfortunately, over time it became the law of the land to pasteurize most of the milks in this country, no matter if they came from healthy cows or sick cows. Nowadays, it’s probably a good thing that they still pasteurize milk because most dairy cows live horribly sick lives, stuck in feed lots away from sunshine and green pastures. Most cows live in their own filth and need lots of antibiotics to stay alive. Their milk is just as bad if not even worst than the bad milks produced by the city cows in the 1800s. However, there are still conscientious dairy farmers who raise their cows properly and give them plenty of green pasture and sunlight. Some of these farmers also produce awesome clean raw milk for the public to drink. I’m lucky to live in California, one of very, very few states that still allows the public to buy raw milk. When I realized that raw milk was so awesome and available at the nearby Whole Foods, I jumped at the opportunity to buy a jug of it and try it out. I still had a lot of apprehension as the taste of pasteurized milk grosses me out, but I was willing to at least give raw milk a go. I bought myself a half gallon jug of Organic Pastures Whole Raw Milk and poured myself a glass. And. it. was. DELICIOUS! I couldn’t believe it! It tasted like I was drinking yummy ice cream, not the horrible pasteurized milk flavor I had grown to hate. It was amazing, suddenly, I couldn’t get enough of milk! 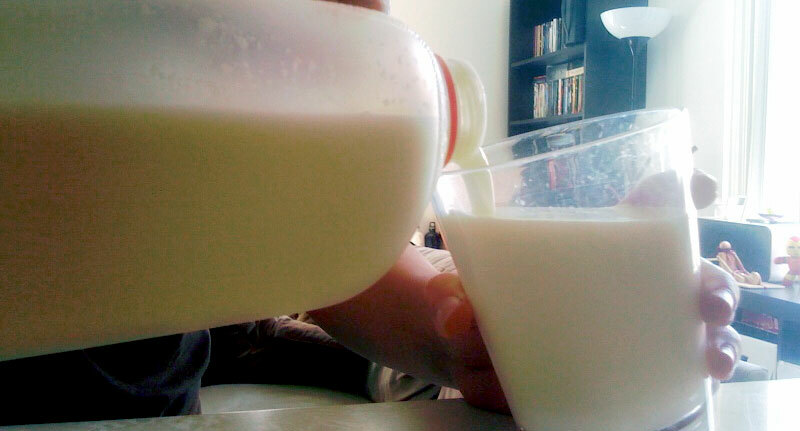 Enjoying a glass of raw whole milk in the morning. Not only were my taste buds excited, my body began to feel more energized. At this point in my life, I had adrenal fatigue (though I didn’t know it yet) and I always felt very low on energy. I had to eat a lot of food in order to feel a normal amount of energy, but raw milk was so nutrient dense that I could go hours and hours with tons of energy after just drinking a glass of it. It made me feel so awesome, that within a week or two of discovering raw milk, I bought myself a bike and began to bike to and from my day job. That was a total of 15 miles of biking each day. I basically went from being a couch potato who barely ever made it to the gym to a bike enthusiast who biked for about 2 hours each day. And all because I introduced raw milk into my life. And it didn’t stop at the biking. With a sudden surge in energy from drinking raw milk, I began to have more energy to research further into holistic health and organic foods. This then led me to observe my health more closely, get the help I needed to fix my ailing body, and gain the super amounts of energy I now experience everyday from eating local, clean, organic and pastured foods. If I had one food to thank for the success I have today, it would be raw milk. This super food truly started my journey to better health! Did you know that whole milk only has 3% fat? Until I did the research, I always wondered why there were 1% and 2% milks. Turns out, you’re not getting that much more fat from whole milk, you’re actually getting more awesome healthy fats by drinking whole milk. As I later learned from the Weston A. Price Foundation, our bodies thrive off of dairy fats and we should get as much of it as we can for good health. Plus, whole raw milk just tastes better than that watery pasteurized skim milk I used to drink as a kid! I still drink raw milk every week and I’ve since added more raw dairies such as cheese, kefir, and on occasion, ice cream! Do you drink raw milk? How do you feel when you drink it? Where do you get your raw milk from? I now get mine from farmers markets because Whole Foods has unfortunately stopped stocking them. Tell me about your experiences with raw and pasteurized milk! I’ve always been fond of pasteurized milk ever since I was a kid. Maybe it’s because my parents always bought whole pasteurized milk. When I got to college, I started drinking 2% pasteurized milk because that’s what my roommates/housemates would buy. I didn’t like it as much, but I figured it was healthier for me. I want to try raw milk! You’re lucky your parents got you whole milk. It’s so much yummier than skim. And you should totally try out raw milk. Go to the Organic Pastures website and put in your zip code in the right hand banner and it’ll show you all the places where you can find their raw milk! Mostly farmers markets and coops, but also a few health food stores carry it, too. I know you’re in SoCal, so if you can’t find a good source near you, let me know and I’ll have you over and give you a glass to try! Hi Jocelyn! I love your article on why you drink raw milk and would love to share it on my blog for my Friday Thoughts and link love! I am actually going to visit the Amish Dairy that supplies our milk club with delicious nutritious creamy dreamy Jersey Cow Raw milk this weekend! As a long time dairy avoider due to sinus and bowel issues, I can saw with complete confidence that taking dairy RAW will either completely alleviate these symptoms or greatly reduce them. There is simply NOTHING better than a cold glass of full fat raw milk. thanks for posting this delightful article so others can see how in love you are with it and hopefully make the effort to find a good source! Hey Alex, I would love for you to share my article! Just let me know if there is anything I can give you in order for you to share it on your blog. I’m very jealous that you’re going to visit an Amish Dairy. That’s so cool! I hope to someday make a trip to see a real pastured dairy farm myself! Have you read anything about the hormones in milk being harmful for your body? That’s something I often hear and I’d be interested to hear your thoughts. A dermatologist passed me this site: http://www.acnemilk.com. It’s an interesting read, but from personal experience I didn’t notice a huge difference in acne when I was on/off milk. Also, would love to see some pictures on your blog. I hadn’t heard of this before, but from personal experience, I had less acne after drinking raw milk than when I wasn’t drinking any milk. I do know that for some people, even raw milk won’t work for their bodies. They’re just completely intolerant of it. Of all the people I know who do drink raw milk, I notice healthy bodies and notably healthy skin. There should be studies done on the difference between drinking raw and pasteurized milk, I bet that would show significant differences between the two. The site you mention doesn’t mention anything about raw milk and I do wonder if that would change things up about the possible hormones in milk. However, I should note that drinking pasteurized milk (and often these are ultra-pasteurized for some reason) is even worse than not drinking any milk. When milk is dead/pasteurized, it’s not doing your body any good, and may even be doing some harm. And yes, even if it’s organic, it’s just dead organic milk. Interesting, well, I’ll give raw milk a go. You buy yours from Whole Foods? I used to buy raw milk at Whole Foods, but they’ve unfortunately stopped stocking it a few months ago. I don’t think they’ll be returning raw milk to their shelves again, so your best bet is to find it at another health food store, a coop, or a farmers market. The easiest way to find a source near you is to go to the Organic Pastures website and put in your zip code in the right hand banner and it’ll show you all the places where you can find their raw milk. Thanks so much Alex! I do look forward to your post. Yes, with all things there are risks. But I truly feel that I am taking fewer risks by drinking raw milk from cows that are healthy and eating what they were meant to eat out in the beautiful California sunshine. Compared to the cows who are stuck in their own filth and may never see the sunshine, nor eat anything other than corn, soy and other horrible unmentionables. Honestly, I think I’d be taking more risks with my health by drinking a pasteurized version of this sickly cow’s milk. Plus, raw milk from pastured cows tastes so much better! I’d love your step by step on making raw kefir from live grains! I used to do this a lot last year but I’ve stopped since raw kefir making is very demanding (at least for my busy schedule). I do think I have a few pictures of when I did do it regularly, so I’ll be sure to post on this soon! increase in milk output also lead to the increased risk of clinical mastitis. risks on cattle and potential effects from the consumption of rBST milk.